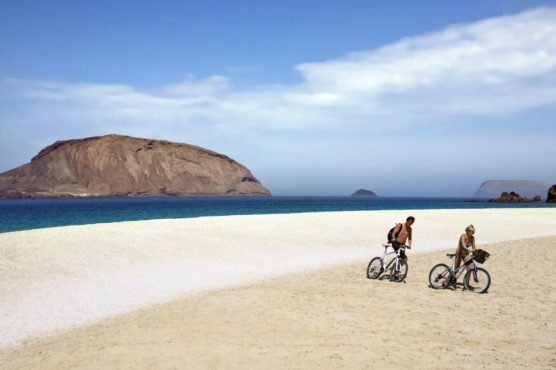 Does the island of La Graciosa sound familiar to you? It belongs to the province of Las Palmas and it’s part of Lanzarote. 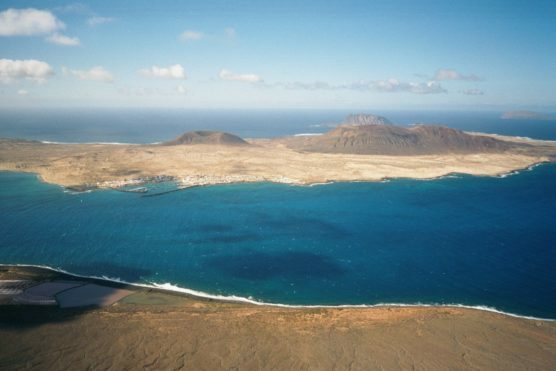 La Graciosa is the largest island in the Chinijo archipelago, and it’s the only one inhabited! With just 700 inhabitants, it’s a small paradise of 29 square kilometers and it’s untouched by the human hand. If Lanzarote is on your list or you are already there, Do visit the island of La Graciosa, you will thank us later 😉. If you wonder how to get from Lanzarote to la Graciosa, read the next lines and you don’t have any excuses not to go now. 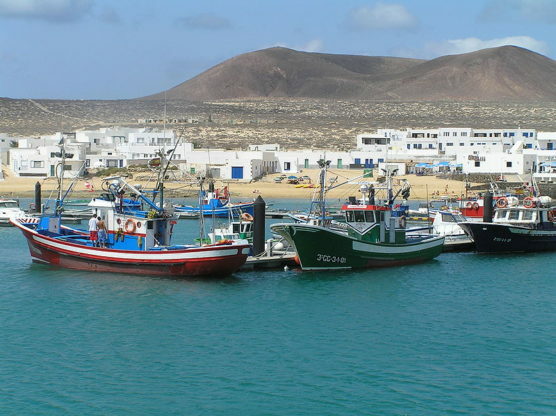 From the port of Órzola, a small fishing village in the north of Lanzarote, you will find boats going to La Graciosa. Although there is a small heliport, the only “accessible” way in which tourists can go from Lanzarote to La Graciosa is by ferry. The journey lasts half an hour and the average price is 20 euros round trip. In addition, according to the company, the ticket can include a parking slot in the port parking. There are regular ferry lines from Órzola port, with a frequency of 30 minutes. Here, you can see the 5 companies that currently offer daily tours from Lanzarote to La Graciosa, as well as their prices and schedules. In general, if you are a Canarian native, you can enjoy a discount on the tickets. On the other hand, to get to the town – Órzola, from which ferries depart, you have to take a taxi or bus. The bus line 9 that leaves from the municipality of Arrecife, is the cheapest way to reach your final destination. Look up here for schedules and stops. The other option is a taxi, but the journey from Arrecife airport to Órzola will cost you around 50 euros. 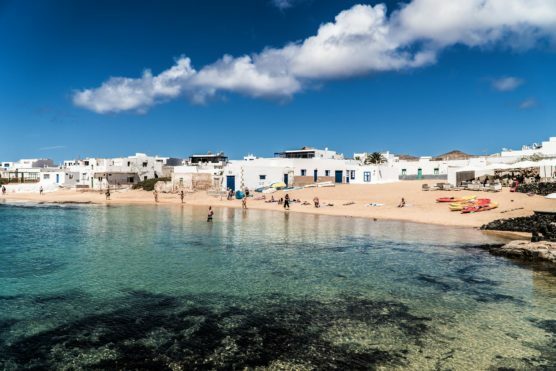 What to do in La Graciosa? This is one of the highlights of the island. You will love Playa de las Conchas, the furthest away located beach from the port, and Playa de la Cocina, with fine sand and crystal clear blue waters. Neither of the two beaches offers facilities. Don’t forget to visit El Salado beach, situated very close to Caleta de Sebo, the capital of the island. It covers almost 2 km and forms beautiful dunes. This beach has facilities. There is almost no traffic and the few roads that are there, aren’t paved. It’s ideal to explore on foot or by bicycle. But, if you need it, you can take one of the 4 × 4 taxis that will drift you away in La Graciosa. There are 3 routes designed for walkers and cyclists that go through mountains, beaches and coves. One is round and runs all over the island, so it’s better to do it if you go by bike. Don’t miss out the highest peak on the island, Las Agudas, which rises up to 266 meters and offers beautiful views over the island. 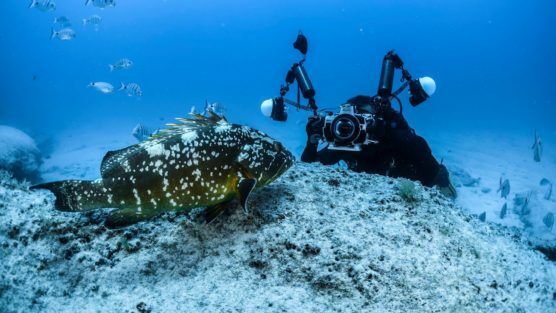 From Lanzarote to La Graciosa, you will find one of the most beautiful diving spots in Europe. They are within the largest marine protected area in the continent: the Marine Reserve of the Chinijo Archipelago. The marine fauna is very varied and creates a spectacular set for divers. In addition, there are different areas for different levels of diving. You can choose between the different courses of the La Graciosa diving center. The waves of La Graciosa are a paradise for surfers. Bajo del Corral and Playa Francesa are the best places for this type of sports. The island is also a perfect spot for practicing kitesurfing thanks to the constant winds, especially in summer, when it’s not raining and the sea breeze is cool.